Generally, these kinds of pictures tend to slip away from my interest pretty quick. It’s quite clear the artist is portraying a scene not too far from his own situation in life. Fawning nobleman crowd around a decrepit building, ruins in the distance. I feel like I am looking at a scene from the early Italian renaissance, and not so much feel any sort of connection, or even consideration of Mary, Joseph, and the baby Jesus. There are a lot of paintings like this, and so it’s easy to move past and gaze at another painting with more insight. Yet, in my wanderings I kept coming back to this one. I would dismiss it, then feel it tugging at me once more. All because of one man. That guy in the lower right corner. What is that expression? He’s there, but he’s aloof, not joining in with the prattle of the other young men, offering nothing to the focus of the scene. Something is going on with him. Like he’s been caught in the view of this scene and wished he wasn’t. There’s a lot of bother going on, so he’s playing his role. But he would rather be elsewhere. Maybe it’s boredom. This baby king business isn’t all that interesting. Or maybe that look is something more. The magi had been to Herod’s before this. Herod sent them on their way to Bethlehem, trusting them to return with a report. But if you know Herod, he was a man who trusted no one. So, he sends a spy to follow the fellows. What would that servant do when the magi have found their baby? Watch, take notes, stay on the edge of the crowd. That’s the look I see with this guy. It’s more sinister than boredom. When I think about the slaughter of the innocents that comes later in the story, I begin to think about this guy. He led the force back to kill the baby, and when they couldn’t identify the right one, they killed them all. Or maybe it’s not all that sinister. Maybe he’s like a lot of us. Distracted by life, but wondering what’s going on. Interested enough to show up, not so interested as to join in with the worship. He’ll wait and see what happens. Totally noncommittal before the now acknowledged King of the Jews. I am intrigued by him because he has a story of some kind. Whether sinister or mundane, he stands out precisely because he seems so out of place with his lack of developed interest — so out of place that he draws the eye away from what should be the focus of the painting, on the Holy Family. He is intriguing because he seems to mock the whole point of painting a scene like this to begin with. Odd thing that. Odd characters make for interesting considerations I suppose. I’ve been spending the day looking at Christmas related art. No, not the typical kitsch filled with children sledding, cottages with smoke pouring from the fireplace, or jolly old elves. I’m having a look at the religious art that accompanies the Christmas story. Most religious art dealing with Mary has very much the Catholic sense about it, highlighting her stature and role as most blessed among women, and in doing that making her to be no real woman at all, but a figure of religious imagination — the goddess some folks wish Christianity had. Here, however, we see a scene. I like this painting because I imagine this is right before the angel disappears. He’s made his announcement that Mary is going to have a baby. She’s gotten over her initial shock. She asked how this was going to happen, the angel replies, “The Holy Spirit will come upon you”. We see the dove coming through the window above the angel’s hand here. “May it be to me as you have said,” Mary replied to the angel. 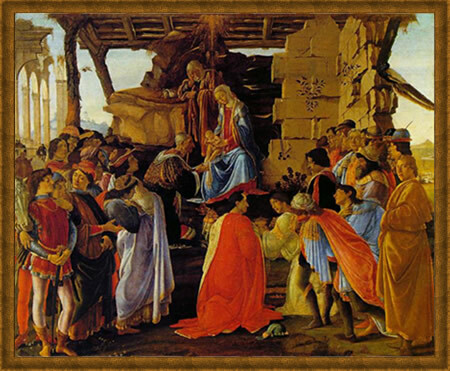 But in this painting we still see the weight of her initial reaction we read about in Luke 1:20. Mary was greatly troubled. “The Lord is with you,” the angel said. Mary was greatly troubled at his words, Luke writes. My guess is she knew her Scriptures. What was going through her mind? Isaiah? Joseph? David? Ruth? Esther? The text doesn’t say she replied with serene peace or with exuberant joy. “What do you mean?” she asks the angel, fearing more than the angel’s presence. Rossetti captures this scene with the right emotions. The angel is blessing Mary, the dove (symbol of the Spirit) is entering. But Mary looks away, looks down, completely unsure about what this really means for her life. She will do her part, and what a part it is, but she’s not quite at the point of acceptance that makes her rejoice in song. That comes later when she greets Elizabeth. Now, the angel has spoken. Mary will do her part. The process of God becoming a man is beginning. Both Mary and the Angel still have the typical plate behind their head, the halo that appears in most medieval art. But, she’s not beaming with joy. She’s a little out of sorts. Now that she is most blessed she has no idea what to think or what to do. In this moment, with it all happening so quick and changing her life in an instant, Mary is indeed troubled. 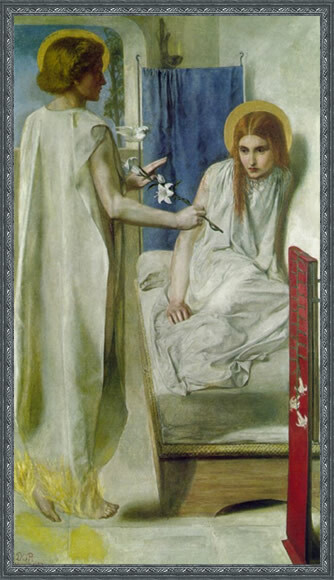 Here in Rossetti’s painting, Mary is human and real — precisely the servant God chose through whom to do a work. Sure, it’s only the beginning of November… way too early to have done something like this. I know. Just had the urge I guess. I bumped Will Farrell’s Elf to the top of my netflix queue and watched it last night. What did I think of it? I liked it. I liked it a lot more than I expected to like it. Indeed, I think it’s a keeper. I’m glad I watched it now, instead of when it came out or later on closer to Christmas. I’m glad because watching it now gave me a perfect analogy for what I said a few days ago. I love movies that hit presently exploring themes.